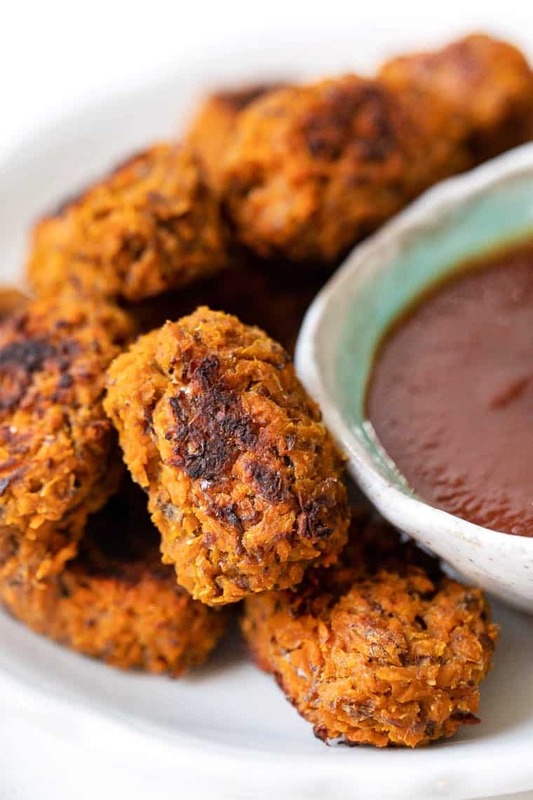 How to make vegan sweet potato tots. 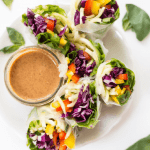 A quick and easy vegan recipe that is healthy, delicious and makes a great light appetizer, snack or breakfast side! Remember the healthy broccoli tots I shared a few years ago? Well, I was having a hankering for them the other day, but I didn't have any broccoli on hand. My mind immediately jumped to cauliflower, but I was out of that too, so…we landed on sweet potato. 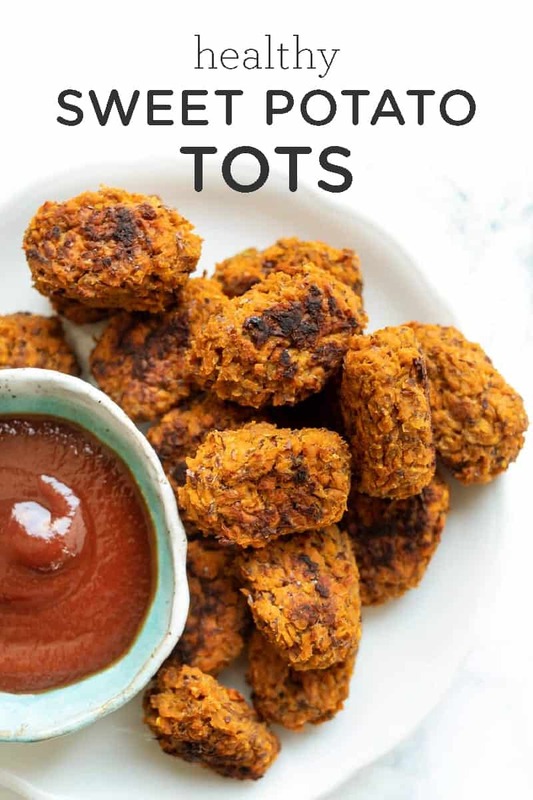 I don't know about you, but I used to love tater tots. I mean I still do, but most of the time they're made with gluten, so they're a no-go for me. I decided to create my own lightened up version of tater tots that uses sweet potato instead of white potato (= more nutrition!) and we're baking them instead of deep fry. The result? Healthy and vegan sweet potato tots that are the perfect little bite! 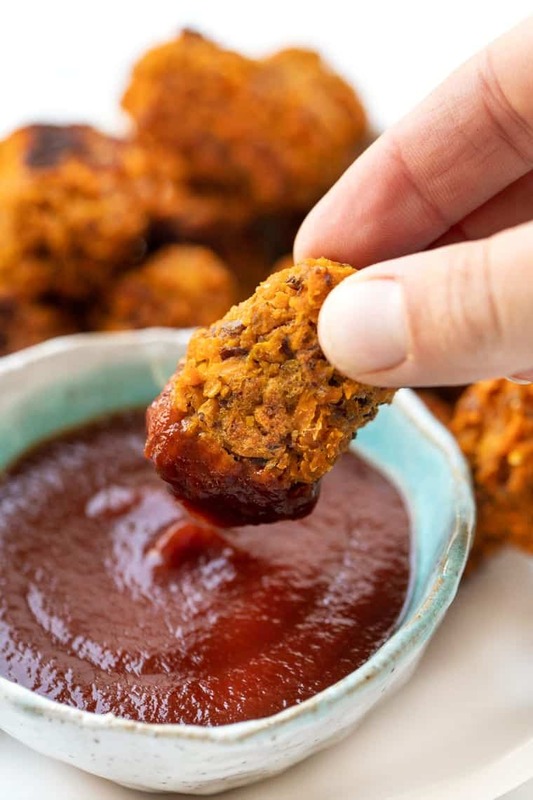 The first part of making healthy tater tots is your potato. We're using sweet potato and I like to use either jewel or yams. You could also totally use white Japanese sweet potatoes if you want them to look more “traditional”! All you need to do is first peel your sweet potatoes. Then just cut them into spears (about 1″ – 2″ wide) and fit your food processor with the grating blade. Turn on the machine and push those spears through the top. 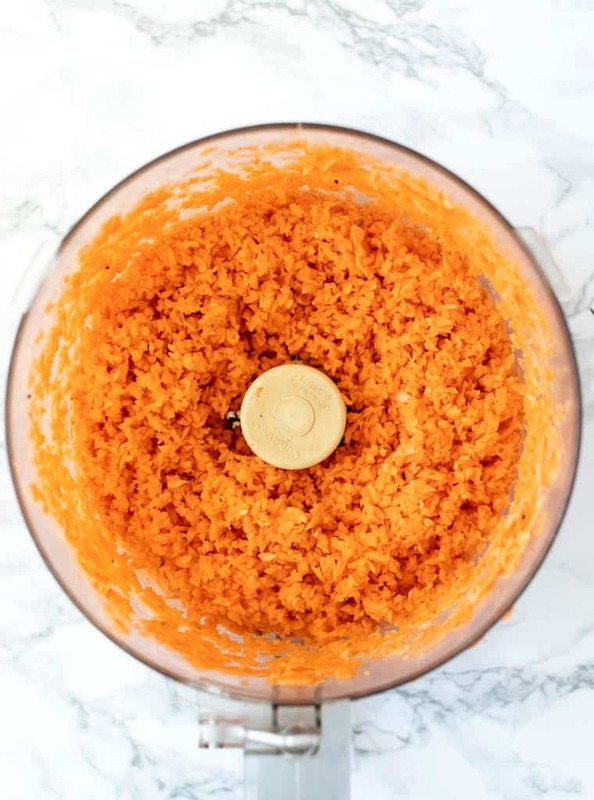 In about 30 seconds, you'll have all your sweet potatoes perfectly grated! We're going to bake our tater tots which mean we need the dough to really hold together. The first thing we'll need to do is steam our sweet potato. You can just add it right into a dry skillet, add a splash water and cook it for about 3 minutes. It should be soft and tender when you taste test it. 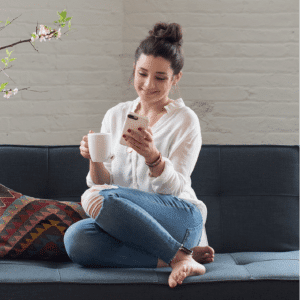 From there, add it into a bowl and add in a flax egg (which is our binder), some nutritional yeast which adds a cheesy flavor AND some plant-based protein, as well as some quinoa flour, spices and the final ingredient…hummus. I know it sounds like a strange combo, but it totally works. The dough should be somewhat sticky and you should be able to easily form it into our tater tot shapes. 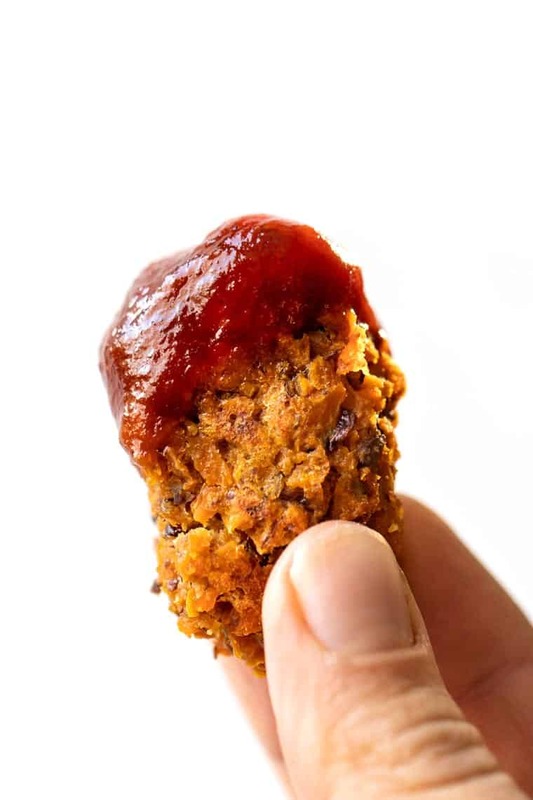 Whoever says you need to deep fry tater tots to get them crispy hasn't tried these because simply baking them for about 30 minutes and flipping them halfway through gives you that crispy outside and soft inside that tater tots are known for. Just as a tater tot should be, but a little bit healthier! 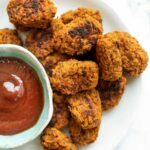 Vegan Sweet Potato Tots For The Win! 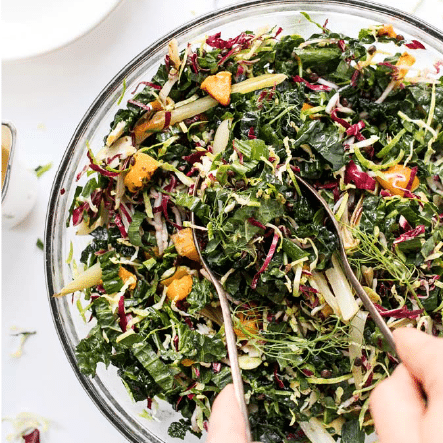 Of course, this recipe is perfect all year round, but I especially love it if you're hosting a Super Bowl Party! For some reason, it just feels like the perfect football food. 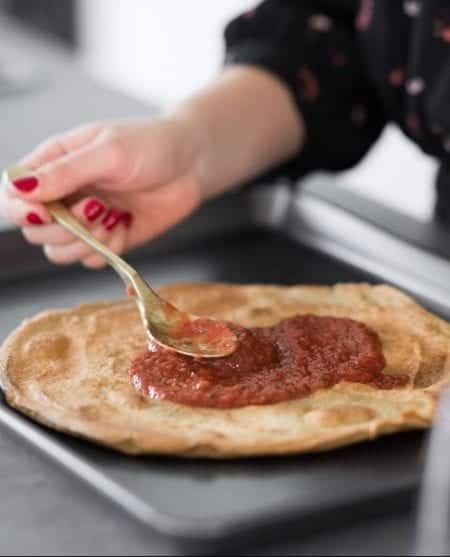 You can either serve them up as an appetizer, or they also make a really great after-school snack, addition to kids lunches OR a fab little breakfast treat with a side of some eggs. 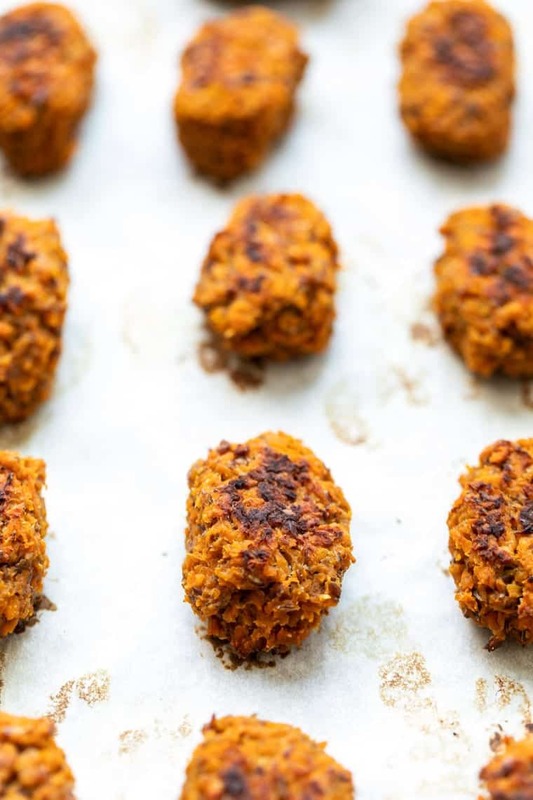 These easy vegan sweet potato tots are a cinch to make! They use just 6 ingredients, taste amazing and are a fabulous alternative to frozen ones! Grate two large sweet potatoes using a box grater or food processor. Once grated, measure out three cups and give them a quick chop. Add the sweet potato to a skillet and steam for 4 - 5 minutes until tender. While sweet potato is steaming, whisk together flaxseed meal and water and set aside. Allow sweet potato to cool for 5 - 10 and transfer it to a large bowl. Add the remaining ingredients, including the flax eggs, starting with just 1 tablespoon of hummus. Stir together until it forms a dough. If the mixture seems a bit dry, add the other tablespoon of hummus. Line a baking sheet with parchment paper and form the dough into small balls or tots. Chill in the fridge for at least 30 minutes. When ready to bake, preheat the oven to 400ºF. Bake for 20 - 25 minutes, flipping halfway through. These look amazing! Do you think they could be frozen? I’d love to make a big batch for easy meals! Could I cook these in an air fryer? These look so good, I need to try them asap! Love the addition of hummus in this recipe.